Few things are better than the Bermuda weather forecast. If you are familiar with the term "Bermuda High," then you know exactly what we mean. Check below for the current Bermuda weather, and keep reading for everything you need to know about the weather in Bermuda. The Bermuda weather forecast is a bit of an anomaly, particularly if you consider its latitude. Bermuda, located in the North Atlantic Ocean, almost parallel to North Carolina in the United States. This causes larger temperature fluctuations for the weather in Bermuda. 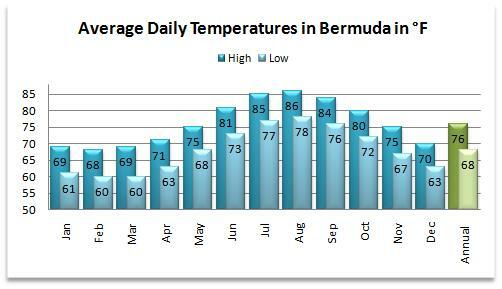 However, no matter the time of year, you can expect the current Bermuda weather to be sub-tropical. The sub-tropical climate is fueled by the Gulf Stream passing between the Islands and the North America, making the crystal blue waters warm and the air temperate. The summers in Bermuda are hot and highly humid. The year-round mean relative humidity is 77%, with the humidity is less in winter months and much more in the months of summer. It is not uncommon to need to change shirts a few times a day in the summer. The winters are mild and pleasantly cool. Spring like temperatures prevail during winter. The coldest months are from December through April, where the average high temperature is just below 70°F (21.1°) and the average low is near 60°F (15.6°). Strong winds are common in winter season which makes the temperature cooler. While the waters may be a little too cool for swimming, the temperature is nearly perfect to go for scuba diving, snorkeling, golf, and tennis. Weather Bermuda: Rain? What Rain? Bermuda has no rainy season. There is moderate rainfall in Bermuda all the year round. Showers are generally short and they may be heavy at times but, skies get cleared very quickly. Average rain fall in a year in Bermuda is 57 inches. Hurricane season in Bermuda lasts from June to November. Bermuda is more frequently hit by hurricanes than many of the Caribbean islands to its south. It is brushed or hit directly by a major tropical storm system every 2.6 years on average, and is hit directly every 10.5 years or so on average. Meteorological departments issue hurricane warnings accurately and in a timely fashion, giving enough time for tourists and residents to take precautions. Spring to autumn is the peak tourist season due to its comfortable daytime temperatures. The Bermuda weather forecast makes it extremely hard to choose against it as your vacation and holiday destination of choice.